The Dock in OS X is probably the most hated and loved feature of the operating system. Many of the early articles written about OS X complained bitterly about it. Apple listened and has improved it, but just like other new things, users made early snap decisions without really giving it a fair try. I wonder how many of the early complainers are now using it without reservation, but have either never rebutted their earlier writings or written further articles. How many readers have never gone back to look for further opinions about the dock? The OS X user should really give the dock a try before finding some piece of shareware to do away with it, only replace it with something reminiscent of features from earlier operating systems. While it is possible to "turn it off," its presence will save you many extra mouse clicks and trips into the hard drive window. The Dock resides at the bottom of the screen. A number of icons are present in the dock ready for your use. They are, in order: Finder, Mail (Apple's own new mail program for OS X), Microsoft Internet Explorer for X, iTunes, iMovie, Sherlock, QuickTime Player, and System Preferences. Note the thin white line that is next. It is followed by the an icon that takes you directly to the Apple OS X Web site, then the Trash Can. If an application has been started, there is a small black triangle under its icon. Clicking on icons of applications with the triangle is in effect, an application switcher. Click the icon of the program you want to make active. The dock will help you if you do not know the name of an icon by revealing it right above the icon. It is possible to add more applications to the dock in order to use it as a launcher. Simply drag the application icons to the dock. As you add more icons, the dock can fill the width of the screen. As more icons are added they will automatically get smaller. If you do not like the order the icons are in, simply drag them sideways, one at a time in any order. Spaces will open to accommodate them. If there is an icon for a un-launched program that you would like to remove, simply drag it up and out of the dock. It will disappear in a pouf of smoke. The thin line toward the right end of the dock divides the applications from documents, folders, servers, Web sites, QuickTime TV channels, and the trash can. It is a great place to store icons that link to your document folder, perhaps a stationary item like a letterhead and documents you are currently working on. At the top left corner of each window in OS X are red, yellow, and green buttons. If you click the yellow button, that window travels down to the dock , out of the way, but still open, until you need it again. So, in effect the dock replaces all those rolled up windows that used to clutter the desktop after you clicked the window shade button. The thin line can also be used to resize the dock. Put the cursor directly over the line and pause without clicking the mouse button. When the double-headed icon appears, click the mouse button and drag the line to the right to make the icons smaller. Click and drag it to the left to make the icons smaller. Some applications, iTunes being one, have a number of commands that can be activated simply by clicking and holding the mouse button on their icon in the dock. 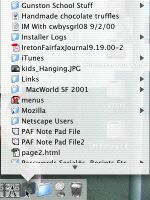 Clicking and holding on a folder stored in the dock will cause a pop-up menu to appear that can be used to navigate the folder. If you hold down the Command (Apple) key, and press the tab key, the icons of programs that have been launched will become selected in order. Let go of the keys and the selected application will become active. Hold down the option key while you press the icon of a launched application. A pop-up menu will appear with the Force Quit command. Press the Command key while clicking on an application icon. The window that contains the icon will open. As with all Macintosh controllers, there is a preferences window that can be used to change settings for the dock. The most modern way of getting to the settings is to press the control key on the keyboard while you click and hold over the line. That will bring up a contextual menu that allow you to change many of the dock's features. If that is hard to remember, you can also get to the dock settings through the "System Preferences" icon in the dock or under the "Apple" menu. While dock size is self-explanatory, magnification may not be. When it is selected, the icons in the dock grow larger as you pass the mouse cursor over them. This is very nice when your icons are tiny because the dock has lots of items in it. Hiding the dock is an option if you do not like it at the bottom or sides of your screen. However it takes a moment to appear when you take the mouse cursor to the bottom or sides of the screen. I move my dock regularly, depending on what I am doing. I find it indispensable. Minimizing the dock with the "Genie Effect" instead of the Scale Effect" is more impressive, but if you are a minimalist, you may prefer it. If opening applications are not animated, they do not bounce in the dock. Once again, minimalists may want to turn it off. There is far more to the dock than first meets the eye. It replaces several well-liked features of earlier operating systems with an attractive, easy to manage central command area. If you are just beginning to use OS X, give it a try. If you have been using OS X for a while and have turned it off, give it another try. If you like it, but have not tried all the features discussed, keep this article handy and explore the dock some more. Pat Fauquet teaches many of the classes taught at Washington Apple Pi. She is a confirmed convert to OS X who dreads having to boot back into OS 9 now that she has really given OS X a try.